Samaritan’s Purse will be returning to Northfield Shopping Centre this week to launch the 2018 Operation Christmas Child Shoebox Appeal. Volunteers from the Christian charity collected more than 3,200 shoeboxes last year for children around the world and will be at the centre between Tuesday 23 October and Saturday 27 October to encourage shoppers to take part in the initiative. Throughout the week, volunteers will be giving out information and empty shoeboxes as well as showing people sample packages. 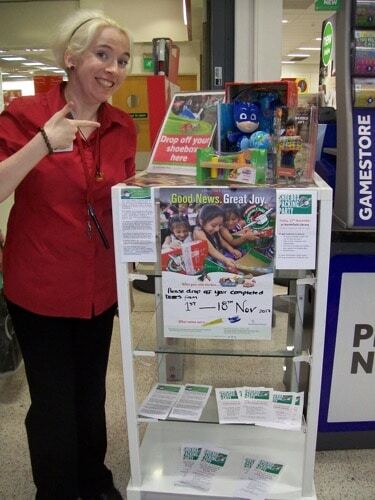 Customers can donate such items as small toys, pens, pencils, crayons, toothbrushes, toothpaste and soap etc. Costa, Shoezone and Wilko’s will be drop-off points for the appeal until 18 November. Susan Parker, the local Operation Christmas Child Area Coordinator, said: “Sadly, there are many children around the world and close to home who have no personal possessions. Some have never had a toy or any gift to enjoy, and some cannot go to school because they do not have their own pencil and paper. “Each gift gives a child joy and a reason to smile and lets them know that they are loved and not forgotten. It brings hope for a brighter future as they now know that something good can happen to them. This is a wonderful opportunity to impact the lives of children in difficult circumstances and their communities. Adam Meade, Northfield Shopping Centre manager, said: ‘’It’s great to see the community come together and donate to those less fortunate this Christmas. The appeal has a fantastic response every year.